Celebrate your special event at one of beautiful ballrooms: Olga's Ballroom in Hialeah, Olga's Banquet Hall in Miami, Olga's Reception Halls in Miami, and Forever Reception Hall in Hialeah. 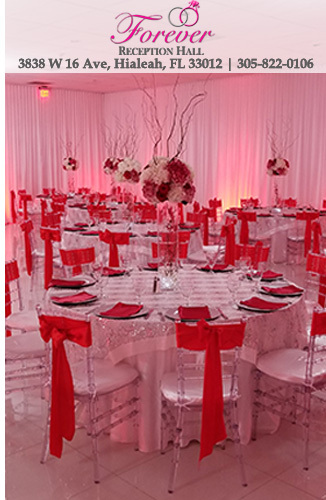 Olga's Ballroom will make the perfect reception hall in Hialeah for your special event. 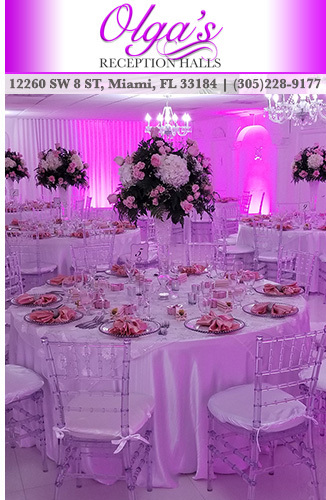 We have over 20 years of experience in the event planning business and countless satisfied customers. Every event is designed according to our customer's desires and taste. 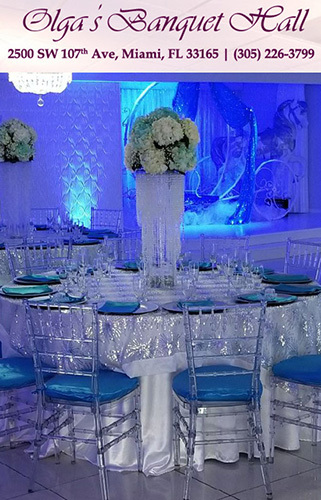 At Olga's Ballroom, banquet halls in Hialeah, your special event will be unique whether it be a Wedding, Quinces, Sweet 16, Anniversary, Birthday, Baby Shower, Bridal Shower, Graduation, Baptism, Communion, Bat Mitzvah, Corporate Event, and more. Olga's Ballroom has many banquet hall packages. 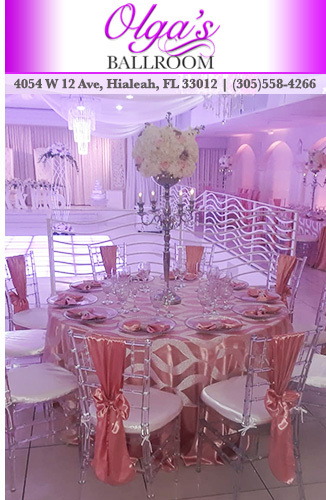 Olga's Ballroom Hialeah offers an amazing location to entertain your guests and caters to your every need: beautiful Reception hall decorations, flower arrangements, cake, catering, complete bar service, stage, photographer, limousine services, and more.